Elastomer refers to a type of polymer which inhibits the properties of elasticity. Elastomers deform when force is applied and return to their original shape after the removal of the force. It is composed of oxygen, hydrogen, carbon and silicon monomers. Rapid growth of automotive industry across the globe has fostered the growth of the elastomers in automotive sector. Automotive elastomers are used in the manufacturing of automobiles parts such as seals, hoses, insulators, engine mounts, gaskets and other parts. Global automotive elastomers market is anticipated to grow at a CAGR of 5.72% over the forecast period. The automotive elastomers market accounted for USD 9.2 Billion in 2015. Rising demand for lightweight vehicles is anticipated to intensify the growth of global automotive elastomers market. Significant growth of automotive sector in the developing regions such as Asia-Pacific and Latin America is envisioned to bolster the demand for automotive elastomers in the region. Asia-Pacific captures the largest market share in the global automotive elastomers and is likely to showcase a lucrative growth over the forecast period. 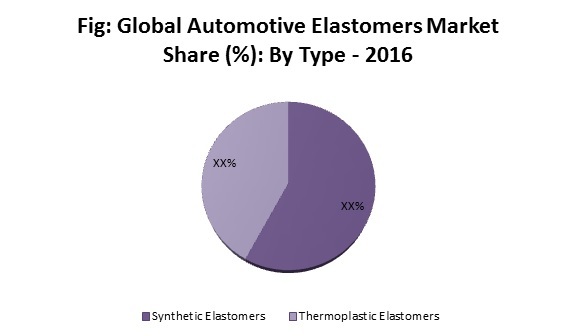 Spiked growth of automotive industry in the region is likely to garner the growth of automotive elastomers market. Asian countries such as China, Japan and others have the potential to be the key suppliers of automotive elastomers in the near future. Moreover, China and India are anticipated to hold the largest market share in the automotive elastomers on the account of largest vehicle production countries in the Asia-Pacific region. Europe region is anticipated to showcase modest growth in the next few years. This can be attributed to various factors such as strict emission regulation and rising adoption of low weight vehicles. Apart from this, well established automotive industry in the Europe region is envisioned to bolster the growth of automotive elastomers market in the region. The growth of automotive elastomers market is driven by increasing demand for lightweight vehicles and strict emission rules. Further, increased demand and adoption of fuel-efficient vehicles is expected to positively impact the growth of global automotive elastomer market. Moreover, spiked growth of automotive industry in the developing regions is expected to garner the growth of global automotive elastomer market. Ongoing trend of electrification of vehicle is anticipated to be the dynamic factor behind the growth of automotive elastomer market. Government regulatory bodies are focused toward creating awareness among consumers regarding the carbon emission generated from automotive. For instance, the government bodies based in Europe provide incentives such as tax reduction or exemption for electric vehicles. Further, these tax rates play an important role for the demand of product. Apart from this, increasing demand for low weight automobiles has been witnessed in recent years. The automotive elastomers help the vehicle manufacturers to reduce the weight of the vehicle. Moreover, advantages offered by automotive elastomers such as customization and high performance is one of key factors driving the growth of the automotive elastomer market. However, high cost of the elastomer is projected to dampen the growth of global automotive elastomer market. Moreover, fluctuating price of raw material of elastomers is anticipated to further restrain the growth of the market.